Casey Carle, International Soap Bubble Artist, performed as part of a music and arts concert at Avery Fisher Hall in Lincoln Center. When the Little Orchestra Society performed at Lincoln Center in New York City on Saturday April 17, 2010, some of the most carefully planned moments went over the young audience members' heads — and that's exactly what Dino Anagnost wanted. Mr. Anagnost, the ensemble's music director and conductor, presented as part of the premiere of the program "Aerialists, Athletes and Arpeggios," a concert in which acrobats soared along with flute lines, trapeze artists lingered in the air like notes, and bubbles seem to float on melodies. Anagnost explained that when he devised the airy theme, he thought soap bubbles should be included, so he invited Casey Carle, an acclaimed, international comic "bubble artist," to perform to Shostakovich's "Waltz 2" from the Suite for Variety Orchestra No. 1. "The reaction from the audience was astounding", Mr. Carle noted after the shows, "there were about 2000 people at each show so the actual volume of excitement and applause was somewhat overwhelming! It was like being at the center of an indoor fireworks display, but instead of rockets I was hearing explosions of delighted human voices." Mr. Carle capped off his presentation by encasing a member of the audience in a giant soap bubble, while the orchestra played the ever appropriate "I'm Forever Blowing Bubbles"; likely a first in the 50 year history of this acclaimed performing arts center. By the end of the day, Maestro Anagnost, developer of this Peabody Awardwinning series entitled Happy Concerts for Young People, had requested discussions begin on presenting more bubble presentations for future concerts. "It's artistically rewarding to develop routines to match the beauty and inherent theatricality of classical music. And there is nothing like sharing a stage with a live, full orchestra who are, literally, 6 feet behind you! ", said Carle, adding, "I look forward to bringing many diverse elements of bubble manipulation to family friendly concerts in New York and, hopefully, nationwide, with the idea of adding the talents of my bubbling colleague, Doug Rougeux, so that the presentations are even more dynamic. Double the bubbling, double the fun!". The bubbles were this big at Lincoln Center for the Little Orchestra Society's presentation that included Casey Carle as a Principal Performing Artist. 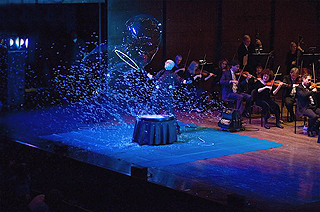 Carle suggested that future shows might include never-before-seen entertainment such as Soap Film Acoustics presented on large projection screens, where an actual soap film is used to demonstrate sound wave patterns from different orchestral instruments, human voices and humorous body sounds, and a routine that finds Carle trapped inside a giant, seven-foot, clear sphere with balloons, bubbles and fog floating and spinning around him like a human-size snow globe. "On behalf of Maestro Dino Anagnost, and all of us at The Little Orchestra Society, I would like to extend my warmest thanks and congratulations for your extraordinary participation as a Principal Performer in our production at Avery Fisher Hall, Lincoln Center. I never knew that bubbles could be so beautiful! Thank you for your wonderful work in making this production a truly special event for everyone who attended."